Tizer, aka Turbo B Tiger and nka Turbo, was adopted the week before Christmas in Plano. He made the long drive back with his forever family to their home on the shores of Deep Creek Lake in the mountains of western Maryland, which he happily shares with a small orange cat and a large Irish Wolfhound. 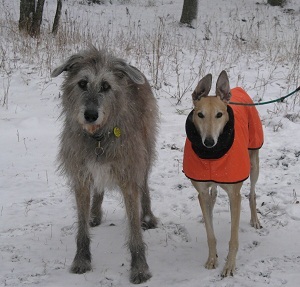 Here he is adapting to the cold winter climate with his new best friend Teagan.